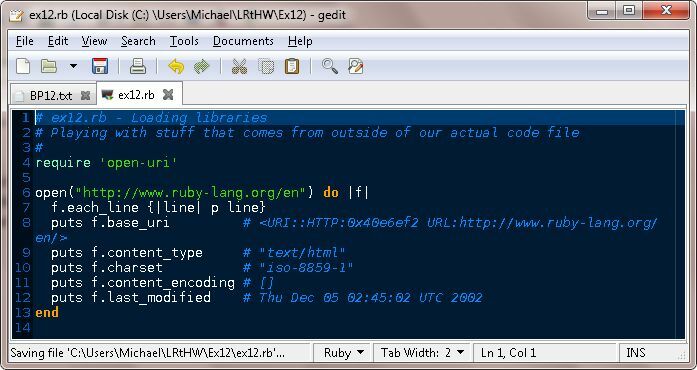 Anyone who has spent any time around Ruby has heard about gems and other files that can be called into your ruby scripts. There's a variety of names for this, and the one that's most common and understood by most developers and even casual programmers are "libraries". A library is a collection or readily written items that we can call on and "the wiring under the board" has already been done for us. 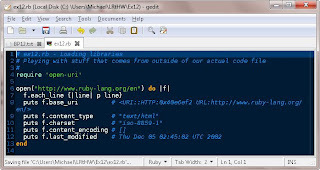 Below is some example code that is being pulled in from a library. Note also that it uses some actual block structure (see the do and the end and the indentation of code. this is the first code we've seen formatted like this, which leads me to believe we'll be seeing more stuff like it shortly). So the first line uses a command "require". What is it? What makes it special? And why should I be requiring it in the first place? The simple answer is that, instead of reinventing the wheel lots of code has already been written for us to call, to use, and to reference when we write our own code. Zed calls these "features" and that's fine, but most anyone who's had any involvement with a programming language recognizes a library when they see one :). Research the difference between require and include. How are they different? Can you require a script that doesn't contain a library specifically? 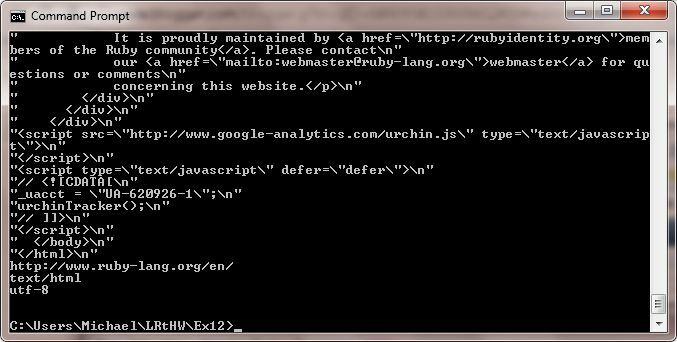 Figure out which directories on your system Ruby will look in to find the libraries you require. OK, that's kind of interesting, and a bit unexpected. I've seen the require, and I figured it worked like include. I'm not sure I get why the different nomenclature; it seems to me if include is such a de-facto standard in languages, why change it in Ruby? Note, I don't have the answer for that, it's a question I have right now.